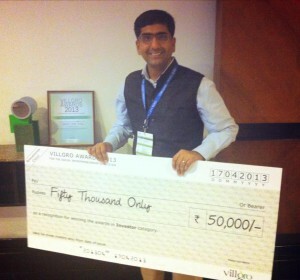 Unitus Ventures (formerly Unitus Seed Fund) (USF) received the Villgro 2013 award for Best Indian Investor at the Sankalp Unconvention Summit 2013 in Mumbai this week. Vineet Rai, a USF fund advisor and a pioneer of impact investing in India, presented the award to Unitus Ventures (formerly Unitus Seed Fund) partner Srikrishna Ramamoorthy. The Villgro Awards recognizes outstanding individuals and enterprises in the Social Entrepreneurship Ecosystem. Nominations were taken across the categories of Lifetime achievement, Social Enterprise, Social Investor, Media House, Journalist, Grass Roots Innovator, Social Incubator, and Academic Contribution. The jury consisted of some of India’s business and government elite including Mr. N.K. Singh, Member of Rajya Sabha, K Ananth Krishnan, CTO of Tata Consultancy Services and Ramya Venkataraman, Leader of McKinsey and Company’s Education Practice in India, among others.